If you aren't a fan of spinach and broccoli, you can get the same nutritional benefits from wheatgrass. Despite the claim that wheatgrass is a "superfood," NHS Choices dispels the myth, noting that it is equivalent to any other green vegetable. A single shot of wheatgrass won't count as one of your five daily fruit and veggie servings, but it can contribute towards your daily intake. 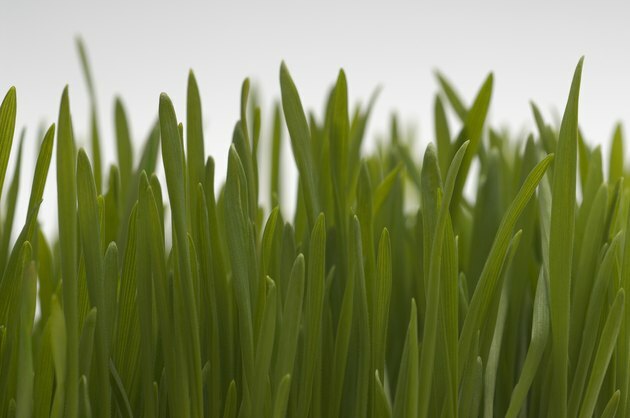 The antioxidant activity of wheatgrass is also thought to improve liver health, but more studies are needed. Your liver is involved in a range of life-giving functions including energy metabolism, fat production and blood clotting. If this large organ becomes fatigued or diseased due to damage or fatty buildup, you may need a special diet that includes fewer fats and more carbohydrates. Wheatgrass is a plant carbohydrate food, but it is not considered to be more nutritious for the liver than other fruits and vegetables. An animal study published in the March 2006 issue of the journal, "Phytotherapy Research" found that some types of wheatgrass helped reduce the buildup of lipid fats in the livers of rats. However, it is not known if this research translates to people or how much wheatgrass would be needed to improve liver function. NHS Choices: Wheatgrass: Detox Tonic or Just Juice?